Artist Antony Gormley using people in artwork called "One & Other"
LONDON, England (CNN) -- The famous "empty" fourth plinth in London's Trafalgar Square is to be occupied by volunteers for 100 consecutive days, 24 hours a day, the artist Antony Gormley has announced. 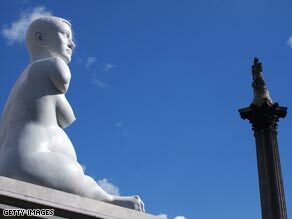 Marc Quinn's work "Alison Lapper Pregnant" caused a stir when it was unveiled on the fourth plinth. Since 2005 the Mayor of London's Fourth Plinth Commissioning Group has picked an artist or artists to fill the landmark space with a new piece. Gormley, renowned for iconic works which include "The Angel of the North," Thursday announced his plans to encourage volunteers from around the UK to stand on the plinth. The work, titled "One & Other," will run from July 6 to October 14 and involve 2,400 people who will stand on the plinth for an hour each. The volunteers can do anything they like on the plinth. Trafalqar Square, which is popular with tourists, is one of London's landmarks. Named after a famed 1805 British naval victory against the French, its centerpiece is a column commemorating Lord Horatio Nelson, who died during the conflict. Over the decades, the square has been the place where Londoners go to celebrate sporting victories or national occasions, as well as stage demonstrations. The fourth plinth is the only one not to hold a statue. Built in 1841, it was intended to hold a tribute to King William IV -- but fundraising efforts proved insufficient. Since then it has remained empty, despite arguments over the decades as to a worthy occupant. In 1999, it was decided that a rotating series of artworks should occupy the plinth. Pieces to have occupied the space in the past have included a life-size statue of Jesus, an inverted replica of the plinth and a colored glass hotel for the square's famed pigeons. Gormley said the idea behind his piece was very simple. "Through putting a person onto the plinth, the body becomes a metaphor, a symbol. In the context of Trafalgar Square with its military, valedictory and male historical statues, this elevation of everyday life to the position formerly occupied by monumental art allows us to reflect on the diversity, vulnerability and particularity of the individual in contemporary society. "It's about people coming together to do something extraordinary and unpredictable. It could be tragic but it could also be funny," Gormley said. London mayor Boris Johnson said it was a fantastic idea. "It's going to be a brilliant case of people coming to art and art coming to the people as the people become the art. A very public demonstration of democracy in action." Ekow Eshun, chair of the Fourth Plinth Commissioning Group, said Gormley's idea was "outstanding." "(It's) a bold, arresting work that reflects on the multi-faceted nature of modern Britain." Applications will be taken from April, with the winning volunteers randomly selected.